The Equatorial Guinea Map Template in PowerPoint format includes two slides, that is, the Equatorial Guinea outline map and Equatorial Guinea political map. Firstly, our Equatorial Guinea out line map template has capital and major cities on it, which are Malabo, Bata, Mongomo, Ebebiyín, and Evinayong. 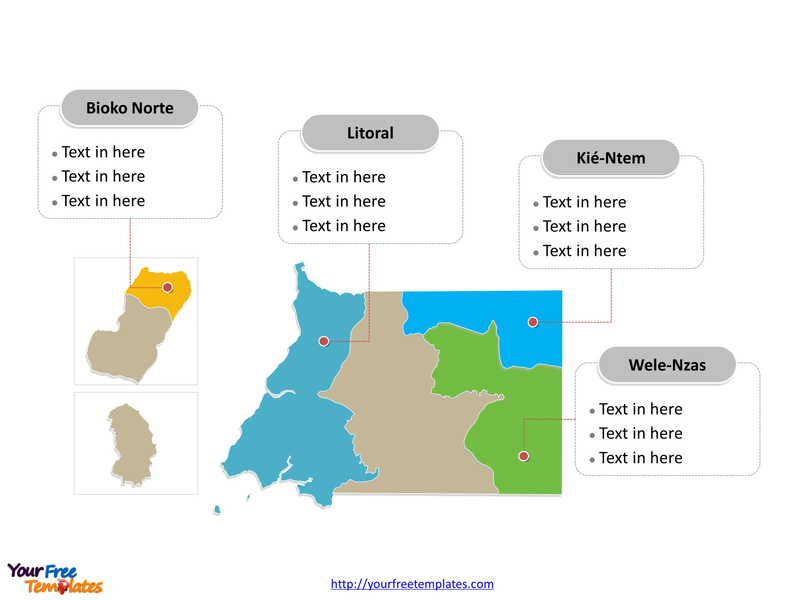 Then, there are seven provinces in our Equatorial Guinea political map template, labeling the most populated provinces that are Litoral, Bioko Norte, Wele-Nzas, and Kié-Ntem. Slide 1, Equatorial Guinea map labeled with capital and major cities. Our Equatorial Guinea map is for the country located in Central Africa, consisting of two parts, an insular and a mainland region. For the first place, the mainland territory’s neighboring countries are Cameroon from the north and Gabon from the east and south. Then the insular region consists of the islands of Bioko in the Gulf of Guinea, which is the northeastern most part of the tropical Atlantic Ocean between Cape Lopez in Gabon, north and west to Cape Palmas in Liberia. 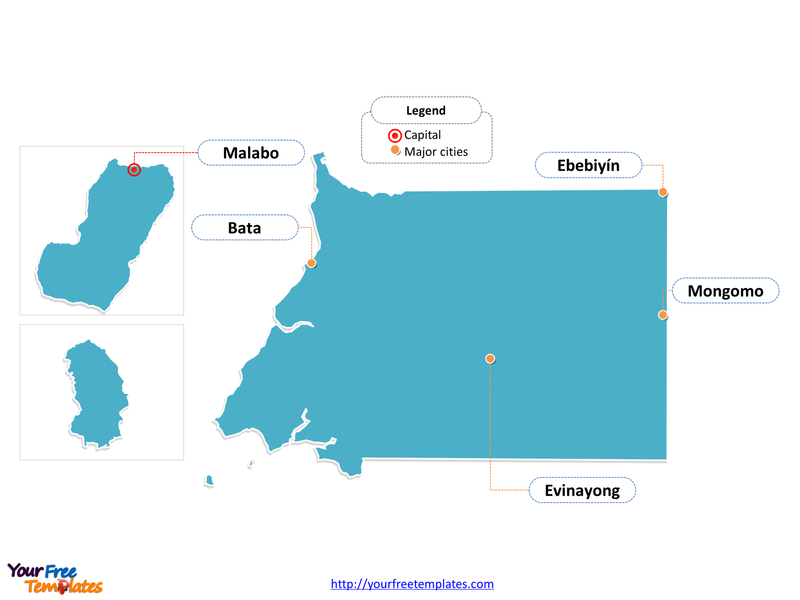 Malabo and Bata is the capital and largest city of Equatorial Guinea respectively, furthermore, other major cities including Mongomo, Ebebiyín, and Evinayong. So our Equatorial Guinea map slide has the capital and major cities on the outline. Consequently users can draw their maps to create unique Equatorial Guinea maps and apply in different reports. Slide 2, Equatorial Guinea map labeled with major regions. The Equatorial Guinea map is the country political map of 7 provinces. They are Annobón, Bioko Norte, Bioko Sur, Centro Sur, Kié-Ntem, Litoral, and Wele-Nzas. Since every individual political province map is an editable shape. In order to facilitate your editing work, we have different layers for the shapes and labels. As a result, you can ungroup the layers to change the texts, colors, sizes, highlight some map shapes, and add your description. Meanwhile you can also refer to the fully labeled Equatorial Guinea map in Wikipedia. As has been noted, professionals from a variety of fields have recommended yourfreetemplates.com as the NO.1 source of map templates; because our maps can really help them in crating attractive presentation.